An important part of the Mission of the Huntersville Fire Department is fire prevention through public education. 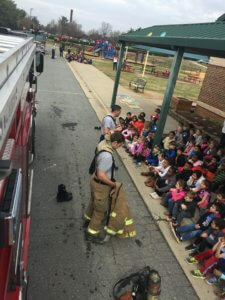 HFD is committed to providing the highest level of service and professionalism to the residents and visitors of Huntersville and to ensure their safety by providing select services geared towards fire prevention education and awareness. Fire trucks are exciting, especially to young children; but they are more than an amusing toy to climb on or a photo backdrop. 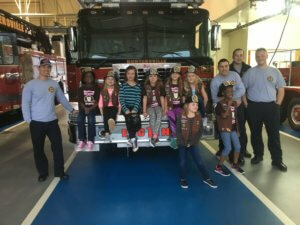 The Huntersville Fire Department utilizes its on-duty personnel and fire trucks, as a reminder and training tool - that practicing safe habits, applying simple fire prevention techniques and fire awareness can prevent injuries and fires from occurring in the community. 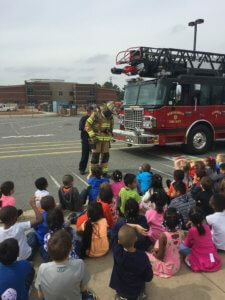 For this very reason, and for budgetary constraints, the Huntersville Fire Department shall only provide fire truck visits to public, primary schools at grades three and higher. We invite / encourage preschools and or daycare facilities to consider visiting us at one of the fire stations where the environment is more controlled and comfortable. Coordinating a station visit and tour is outlined further below. Whenever HFD accepts an invitation and brings a fire truck on-site, the HFD crew will show and explain the truck as well as the equipment and tools within. 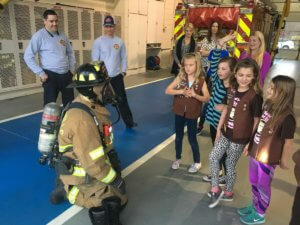 They will also teach children and adults basic fire safety tips such as the importance of smoke detectors, the proper use of 911, the importance of having and practicing a fire escape plan, what to do in the event of a fire or emergency and many other safety tips. If you are interested in having a fire truck come to visit, please send an e-mail request to the following email address: events@huntersvillefd.com at least four weeks in advance (30 to 45 days is preferred) to make a request. You will have to answer some questions related to your request such as: The date and time of your event, total number of participants, age range of the participants and the purpose of your event (i.e. community safety fair, fire prevention education event etc). Your request will then be forwarded to a Chief Officer for approval. Trucks are notavailable for birthday parties, grand openings, sidewalk sales or to support for-profit businesses and events. Due to safety issues, you must have ample space for a Fire Truck to safely park outdoors and leave quickly in the event of an emergency call. Disclaimer: Please note we make every effort to fulfill your request. Program, Firefighter and truck appearances are limited to within the city limits of Huntersville only. HFD reserves the right to decline or cease program participation at any time. Depending upon availability, safety materials may be distributed by the responding Firefighters. Firefighters may have to leave and/or cease the program at any time in the event of an emergency. As mentioned previously and due to our heavy call volume - we do not participate in Birthday parties, nor do we allow parties or events at our fire stations. HOWEVER, there is another option! A local, firefighter owned, business supports events like this and they have an old retired fire truck that they use. It's called the 'Amazi'N Blazi'N Fire Truck' and you can hire them for events - they even make house calls! Check out their Facebook Page. All three Huntersville fire stations are staffed 24 hours a day, 365 days a year with paid duty crews. Guests are welcome at any time during day light hours; however, it's preferred that if you're bringing a group that you call the station you intend to visit (see station list below) at least three weeks in advance (30 to 45 days is preferred) to arrange the visit. You will have to answer some questions related to your request such as: The date and time of your event, total number of participants and age range of the participants. Fire Prevention, Education is a big component of a fire station visit. Expect the crew to show and explain the various fire trucks kept at that particular fire station as well as the equipment and tools within. They will also teach children and adults basic fire safety tips such as the importance of smoke detectors, the proper use of 911, the importance of having and practicing a fire escape plan, what to do in the event of a fire or emergency and many other safety tips. They will also give a brief tour of the station facilities. Visitors are requested to provide an appropriate adult to child ratio to ensure proper span of control. Visitors are reminded that the station is a working, functional fire station and that crews may need to cease the visit at any time to respond to an emergency call. Disclaimer: Please note we make every effort to fulfill your request. HFD reserves the right to decline or cease program participation at any time. Depending upon availability, safety materials may be distributed by the Firefighters giving the tour. Firefighters may have to leave and/or cease the program at anytime in the event of an emergency. 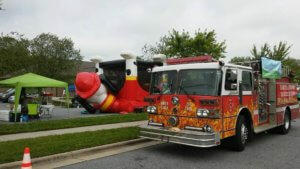 The Huntersville Fire Department DOES NOT inspect nor install car seats. However, our Police Department (the Huntersville Police Department) does, twice a month at one of our fire stations. They offer a morning session and an evening session each month. Please check our EVENT CALENDAR for the next session and location. Additionally, here’s a link that can help answer questions and provide additional details on inspections within the County.